October | 2009 | Great Auk - or Greatest Auk? And I find… I’m not saying this to be cruel, or accuse people of being “sheeple” or some similar horrid term, but it is my observation that a lot of people find thinking tiring. This is merely funny when they’re accusing you of spoiling their favorite book by having the temerity to analyze it, but a bit more serious when they refuse to separate their garbage or buy the non-disposable option. I suspect a lot of it is the particular form that capitalism has taken, especially in the U.S. Our employers do more and more to eat our leisure time, commutes (besides being environmental nightmares in themselves where the public transit is weak) get longer, and the only compensation we’re offered in return is the promise that the things we buy will make our non-work hours a lotus-filled haven of contentment. We’re not free long enough to get bored and actually want to do something, which I (incurable optimist) am convinced that even the most putatively sheep-like person will do eventually when offered a surfeit of leisure. Not that a hearty dose of socialism by itself is going to cure our environmental woes, but a person working two jobs, caring for their children and home in between, may well decide that a special trip down to the recycling center is a corner that can be cut, just like home-cooked meals or exercise or any of the other long-term desirable things that the more fortunate scold us for not doing often enough. And speaking of that home, those children… who is taking care of them? If it’s disproportionately a woman (as, statistically, it often is even when both parents work) then giving up the Swiffer, mucking through the trash bin picking out carelessly discarded bottles, rinsing and reusing plastic baggies, are all likely to fall disproportionately on her as well. As is the work of reminding (read: get criticized for nagging) the partner to do what he needs to do (mulch the lawn clippings, not throw the bottle in the trash to begin with). Again, hard to fault someone who already is burdened for looking for short cuts. Hard to blame someone who already has a lot on their mind for being a “sheeple” when they balk at adding something else. Again, the successful conclusion of the gender revolution is not going to magically solve our environmental problems (not even if we all start praying to Mother Earth or what have you.) But it’s increasingly apparent that a whole lot of our culture is going to have to change, and change in sync, to pull our fat out of the fire. And since rapid social change is generally pretty wrenching (to say nothing of hard to steer) we’d best get on it now and give ourselves as much time as possible to work it out. Because it is going to have to be worked out. This (warning: graphic photos) is one reason why. There’s a new post by yours truly over at the PSFC Environmental Committee’s blog, reprinting an article I wrote about landfills, decomposition, and the pesky truth about those new-fangled biodegradable plastics. Enjoy. The headline says Greedy Dogfish Blamed for Mass. Fishery’s Problems. But the article points out that the spiny dogfish, a small shark species only now recovering from decades of overfishing, is not regarded as the problem by most scientists and regulators. The complaint of the fisherfolk seems to be that the dogfish, or any species that isn’t H. sapiens, has the temerity to eat any fish at all. If this sounds familiar, it’s because the same charges of greed and demands for suppression have been leveled at sea lions, cormorants, orcas… and on and on. And yet, oddly, in all these situations, the only common factor is humankind – human overfishing, human pollution, and in some cases invasive species introduced by humans. So who’s really the greedy one? 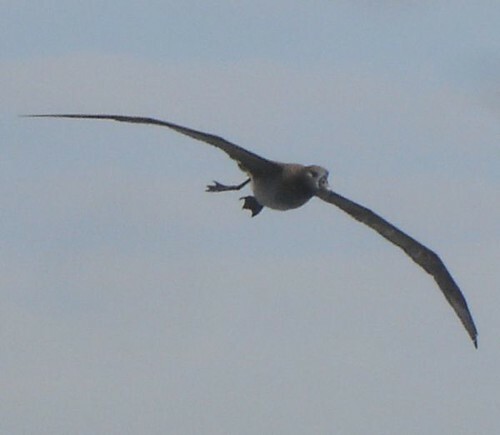 You’d think an albatross would be hard to miss. Especially as the birds were thinning out. There were still Buller’s Shearwaters in plenty, along with a few Pink-footeds and Sooties. 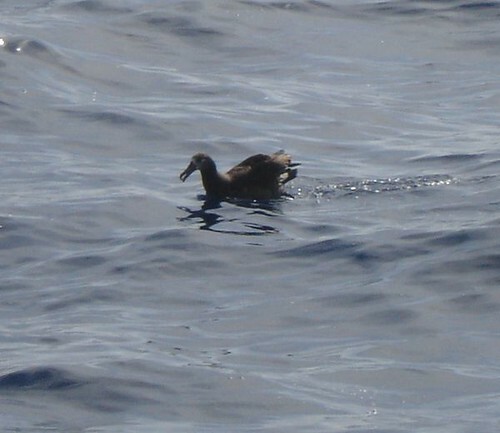 There were still storm-petrels, nearly all Leach’s – but as I mentioned, this didn’t mean that they were all the same bird; this would be the only day that we’d see all the expected races, including the nominate. But overall, this was not the rich and hectic world of our last two days. 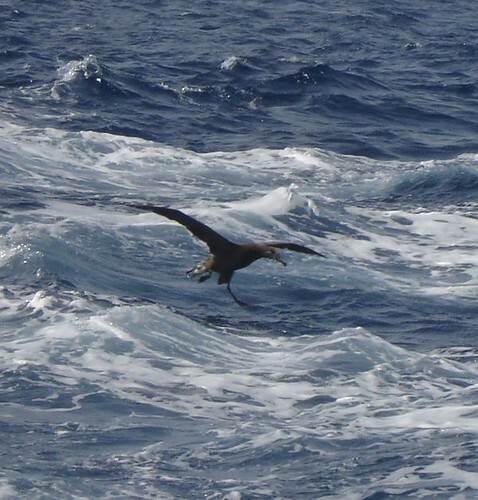 It was, instead, a place to scan the sea and air for the shier, rarer Pacific wanderers, the birds that think nothing of commuting to South America or even Australia, the larger petrels, the tropicbirds, and, of course, the albatrosses. 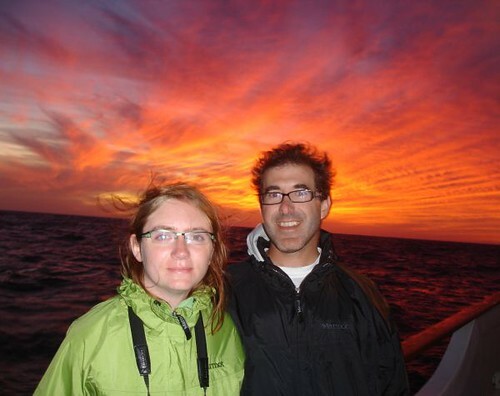 After the previous day’s total cetacean bliss-out, we had to be eased back into sea-mammal watching with a few distant Fin and Blue Whales as we chugged over the Rodriguez Dome into the deep water on the other side of the continental shelf. 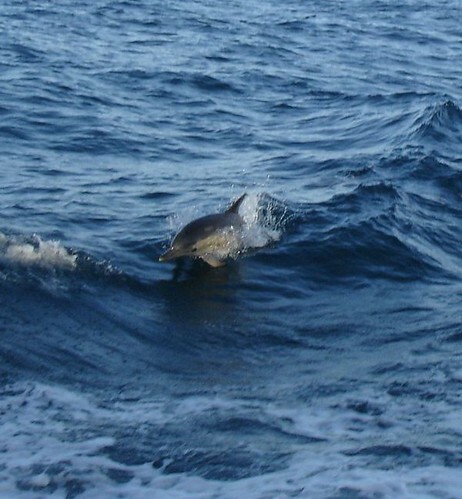 We also encountered dolphins, both our old friends the Common Dolphins (Long and Short-beaked) and the Pacific White-sided Dolphin. We scanned the skies, looking for rarities, trailing a magnificent slick of chum and waiting for the rarities to come. The waiting was neither unexpected nor entirely unpleasant. Eventually some albatrosses showed themselves satisfactorily to the Skeptical Inimitable Todd (although not to his camera). More Leach’s Storm Petrels. 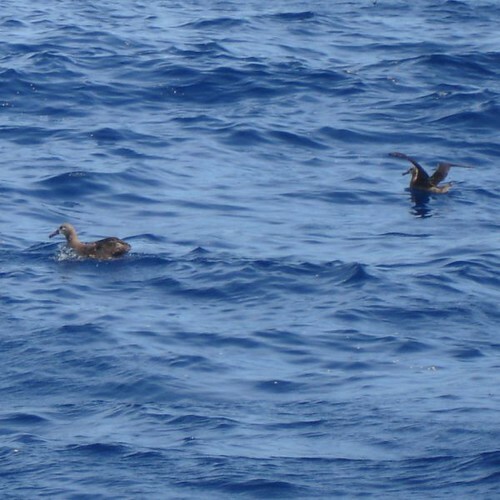 More Buller’s Shearwaters. Skuas, and all the Jaegers. Lots of waves. The Guadalupe Fur Seals were a bit more obliging. Perhaps being thought extinct has prompted them to be more forthcoming, or perhaps it’s just that they’re easier to see. Either way, we spotted 22, of the roughly 10,000 that now exist. That’s more than there are of Xantus’s Murrelet, by the way. Then it was back to practicing our birdwatching Zen. Again, I say this not to complain. There’s a whole lot of Pacific Ocean, as I’ve been pointing out in a variety of hopefully entertaining ways. And it’s impossible to predict which bits of it will have birds and mammals on at any particular time. More terns, more petrels. And just before the dinner call, more Murrelets; subspecies hypoleucus this time, a pair that peeped to each other even as they wound up on either side of the boat. 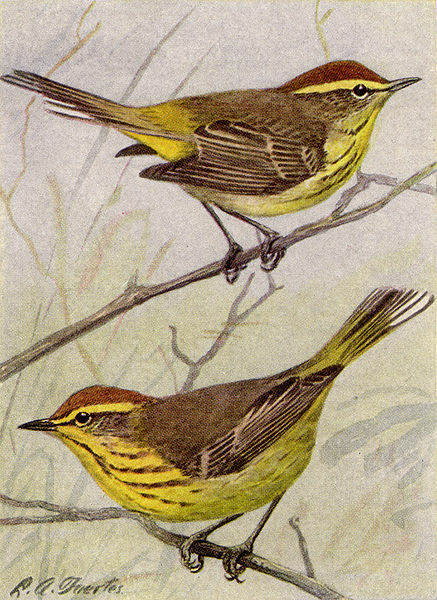 With the engine cut, their calls were clear above the wind and waves and the sound of excited birders rushing from rail to rail. Xantus’s Murrelets are believed to be monogamous, and these two certainly seemed eager to stay together, though even the waves were bigger than them. We watched them for a long time, from our perches above the water. And when they finally flew away, I only hoped that they would be able to find each other again quickly, their life lists perhaps both up by one species of bipedal mammal.